Comprehensive diagnostic assessment of a patient with dizziness, vertigo, or imbalance may include audiometric assessment. There is a close relationship between hearing and balance in relation to inner ear organs. Some patients with dizziness and imbalance symptoms will have co-existing auditory symptoms. For example, the combination of vertigo and audiologic symptoms is a classic presentation in a patient with labyrinthitis and may also be seen in patients after they experience head trauma. Audiologic assessment can provide information about possible retrocochlear or middle ear pathologies that may need to be addressed prior to further vestibular testing and follow-up. At our office, the standard appointment for vestibular patients is a 2.5 hour long appointment, to allow sufficient time to conduct a series of tests including most of the tests described below. Commonly known as a “hearing test”. 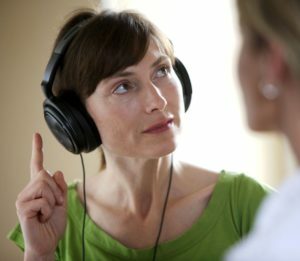 A pure-tone air conduction hearing test determines the faintest tones a person can hear at selected pitches (frequencies), from low to high. During this test, earphones are worn so that information can be obtained for each ear.This test allows to determine the presence, type, and severity of a hearing loss. During this test, speech testing is also performed to determine the softest level the person can detect a word and to determine word recognition in noise. This test takes about 20 minutes to perform. Tympanometry testing assists in the detection of fluid, perforated eardrum, or other abnormalities in the middle ear. This test consists in pushing pressure against the eardrum, making it move back and forth. Acoustic Reflex Testing provides information about the possible location of the hearing problem. This test consists in playing a series of sounds that will cause a tiny muscle in the middle ear to contract. Other middle ear tests performed in our office include Acoustic Reflex Decay and Eustachian Tube Dysfunction Tests. This combination of tests take about 10 minutes to perform. This test is used to detect blockage in the hearing mechanism, as well as presence of middle ear fluid or abnormal function of the hair cells in the cochlea. This is performed by presenting a series of sounds through a small headphone placed in ear canal. This test takes about 5 minutes to perform. VNG has become a standard diagnostic tool in balance assessment and uses infrared video technology to record eye movement while the patient’s eyes are open in darkness. The VNG tests and evaluates eye movement during different activities such as following a visual target, changes in head position, or in response to hot or cold air placed in the ear canal (caloric test). If no response to hot or cold air, we can use ice water to induce a response. The caloric test helps determine if there is a difference between the left and right inner ear. An audiogram is an important part of the examination of a patient with dizziness and is frequently completed before the VNG. This test takes about 60 minutes to perform. Rotary chair testing is an excellent diagnostic tool can be helpful in detecting bilateral and uncompensated unilateral vestibular disorders. Results may be more accurate when used in conjunction with VNG. 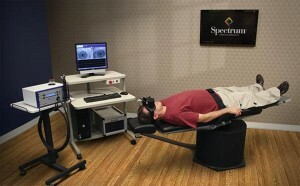 Testing involves whole body rotation with the patient seated and restrained in a motorized rotary chair. Eye movements are recorded in darkness using video-oculography goggles, as in VNG. The patient’s head is properly secured so that the chair and head movements correspond. 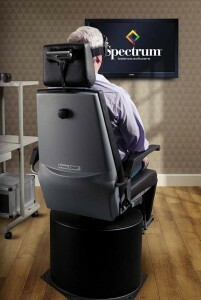 Rotary chair testing assesses both ears simultaneously, rather than independently. A natural stimulus allows for VOR measurements to be taken during physiologically relevant stimulation (i.e., head rotation) at a variety of frequencies. Rotational testing provides important information about residual vestibular function in individuals with bilateral vestibular weakness on caloric testing. This information is critical in selecting appropriate rehabilitative strategies. This test takes about 20 minutes to perform. We are proud to be one of the very few clinics in Texas to offer Rotary Chair Testing! VEMPs offer an electrophysiological method of testing otolith (saccule and utricle) function and potentially both branches of the vestibular nerve. VEMP testing involves measuring a motor response to sound stimulation of the otolith organs. For VEMP testing, clicks and/or tone bursts are introduced via earphones or a bone conduction oscillator. Recordings of waveforms are taken, and asymmetries can be identified between responses generated by stimulating the right and left ears. — This test is not covered by insurance and is only recommended for patients with good neck extension and mobility. This test takes about 20 minutes to perform. ABR is a diagnostic test that gives information about the inner ear and brain pathways for hearing. This test is recommended for those with asymmetrical hearing loss, tinnitus, or dizziness. It is performed by pasting electrodes on the forehead and behind ears, and recording brainstem wave activity in response to sound. The person being tested rests quietly or sleeps while the test is performed. No response is necessary. This test takes about 30 minutes to perform. This test is most often used to determine if the inner ear has an excessive amount of fluid pressure that can cause symptoms of ear fullness, tinnitus, dizziness, and hearing loss. As these symptoms are often indicative of certain ear pathologies such as Meniere’s Disease. It is performed by pasting electrodes on the forehead and placing special gold-foil headphones in ear canals, while the person being tested rests quietly or sleeps while the test is performed. No response is necessary. This test is most often performed with an ABR. The audiologist will determine if this test is necessary based on symptoms. This test takes about 30 minutes to perform.